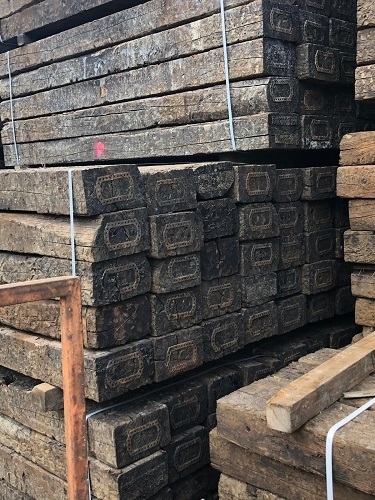 Solid and long lasting hardwood railway sleepers . Generally fairly straight and square edged on one face, with some cracks and occasional rounded edges (waney edge) on the opposite face. Can be heavy to lift, especially the 2.6m x 250mm x 150mm size railway sleepers which can weigh as much as 90 - 95 kilos. Bear this in mind when you are ordering your particular size of railway sleeper. How do I plan to carry the railway sleepers into position? (e.g. the back of a garden). You'll need at least two willing and strong people, and the serious possibility of bribery or coercion. 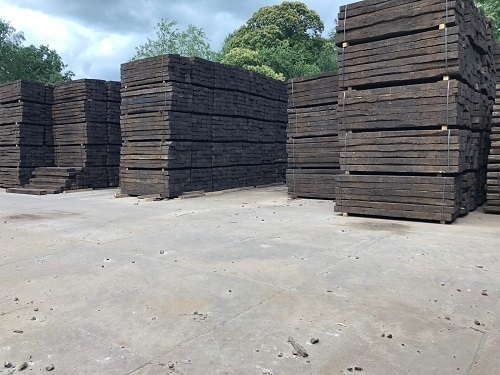 If you chose the 3.6m length railway sleepers (125 kilos) you will need to consider mechanical help or maybe 3 or 4 people per piece. 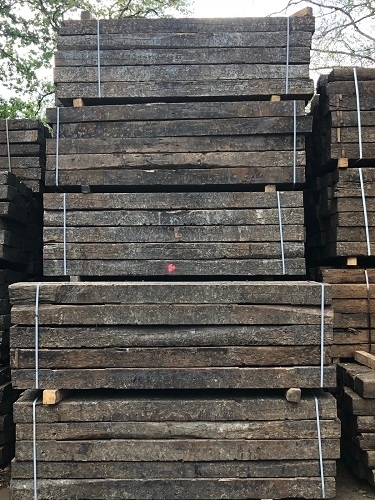 These reclaimed hardwood railway sleepers are probably between 20 - 50 years old, depending on which section of railway they came. The oak is normally square edged on one face, with occasionally some rounded edges (scallops) on the opposite face, where the oak has been cut from the outside of the tree. See pictures above. Quite hard to cut. You'll need a circular saw / chainsaw / powered saw to cut these railway sleepers. Occasionally people try by handsaw, but you have to be very determined or fit. As with any project, it makes sense to try and limit the amount of cuts you need to do. Try and plan a design that fits with the size of our railway sleepers! Timberlok will probably not screw through these railway sleepers without a pilot hole, even if the drill is powerful, so it makes sense to pre-drill.